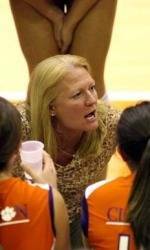 CLEMSON, SC – Head Clemson volleyball coach Jolene Jordan Hoover was named the American Volleyball Coaches Association East Region Coach-of-the-Year on Wednesday, while also guiding a school-record six of her student-athletes to all-region honors. Libero Didem Ege, setter Danielle Hepburn and Meghan Steiner were selected to the 12-member All-East Region team, while outside hitter Jeannette Abbott and right-side hitter Leslie Mansfield were named honorable mention. The Tiger record books were rewritten in 2007, led by Hepburn’s program-best .395 hitting percentage and Ege’s school-record 5.39 digs per game. Hepburn, a junior from Miami, FL, earned her second straight region honor after posting 440 kills with 166 total blocks for the year and now holds the career record for hitting percentage with a .342 figure. Istanbul, Turkey native Ege tallied 615 defensive saves to rank second for a single season, and the senior Steiner (Crystal Lake, IL) hit .381 for the third-best mark in a year. Murphy paced the Clemson offense to a .272 team hitting percentage, second-best for a Tiger team, while recording 12.56 assists per game to rank third all-time. The sophomore from New Lenox, IL also tallied 392 digs and 106 total blocks in 2007. In her 15th season as the helm of the program, Hoover led her Tigers’ team to a 29-4 record and its first trip to the NCAA Tournament since 1999 and its sixth overall. The 2007 ACC champions went 21-1 during the conference season to earn the ACC’s automatic bid to the NCAA Tournament. The Tigers were ranked in the CSTV/AVCA Division I Coaches Top 25 Poll four of the last five weeks of the season, reaching as high as No. 20. Hoover, already the winningest coach in Clemson volleyball history, is now 314-175 as Tigers’ head coach and is only one of three ACC coaches to reach 100 ACC victories. This is the first time that Hoover has won the AVCA Division I East Region Coach-of-the-Year award. She was also named the 1999 Tachikara/AVCA District 3 Coach-of-the-Year. Abbott (Downers Grove, IL) ranked second on the team with 408 kills for her junior campaign, while St. Charles, IL native Mansfield solidified her spot as one of the best all-around players in school history with 289 kills, 371 digs, 75 total blocks and 137 set assists in her final season as a Tiger. East Region Stephanie Barry University of Delaware DS/Lib. So. Jade Brown University of Maryland OH Sr. Carrie DeMange*** Duke University MB Sr. Didem Ege Clemson University DS/Lib. So. Ali Hausfeld**** Duke University S Sr. Danielle Hepburn ** Clemson University MB Jr. Talisa Kellogg Georgia Tech OH Jr. Sarah Kirkwood** University of Virginia OH Sr. Rachael Moss Duke University OH So.Kelsey Murphy Clemson University S So. Ulrike Stegemann** Georgia Tech RS/Opp. Sr. Meghan Steiner Clemson University MB Sr.